The Dark Knight opens today, and I'm pretty excited to see it tonight. 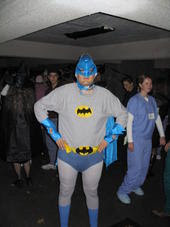 Batman is my favorite movie franchise, but I'm not the type of fan to wear a costume to a midnight showing. I had no problem donning the tights for Halloween '03, however, even though it looks like I ate Robin. Even though I look like George Clooney, and I've really enjoyed every non-Clooney Batman movie that's been made in my lifetime, when it comes to costumes, the Adam West version is clearly the way to go. A friend pointed out that I have no shark repellent on my utility belt, but other than that I think I pull it off pretty well--and even though my physique isn't great, this doesn't look good on anybody. you are the coolest guy i know. You must not know that many guys, Tamara. But thanks.